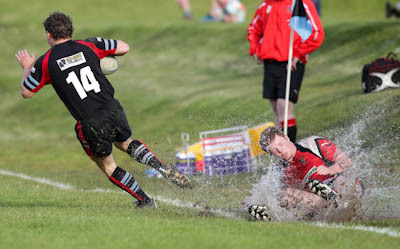 The Cougars welcomed Linlithgow to Barnton for Round 4 of the RBS East League Division 1. 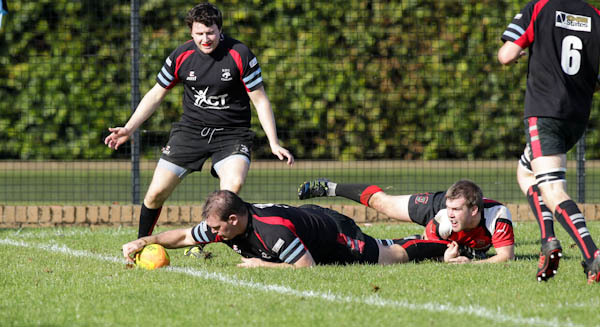 A sunny, Autumn day saw the home side dominate the first half with three tries to Linlithgow’s none. The first try was scored after less than two minutes of play with a well worked move from the backs which saw the try scored benaeth the posts. The successful conversion put the Cougars seven points ahead with just 78 minutes of play left! Five minutes later, the home side crossed the line again for their second try, with a missed conversion, to take the points tally up to 12-0. Linlithgow picked up their game at this point and a bit more – a lot more, actually – possession gave RHC a bit more to think about. A missed penalty, however was about as close as they came to scoring, a few errors, like dropped balls and forward passes, in attack letting them down. With 10 minutes in the half to go, RHC went over in the right hand corner for their third try. A desperate tackle two metres short couldn’t prevent the Cougar’s No. 5 reaching out to place the ball over the line (pictured). With the conversion scored, RHC saw the half out 19-0. Linlithgow did lose two players to injury during the half to a knee and hand/wrist injury which disrupted them a little, but they still had no answer to the home side attack. Or did they? For the first five or so minutes of the second half, RHC were kept in their own territory and a couple of penetrating runs from the visitors backs saw a scrambled defence eventually giving away a penalty five metres out. From the lineout, Linlithgow developed a rolling maul, which rolled up to and over the Cougars line. Try scored, conversion missed, 19-5. The Cougars went on the offensive straight from the kick off, and turning over the Reds’ defence in their 22, a couple of rucks left the ball in the hands of their No.16, who strolled through a huge gap to score the fourth, and bonus point, try for the home side. The missed kick left the score at 24-5. Again, straight from the kick off, the visitors secured the ball and passing it through the backs left their wing with an ‘easy’ (!) 20 metre, jinking run through the despairing defence to score their second try. This time the kick was put over and the score looked a marginally more respectable 24-12. The next five minutes could only be described as suicidal as RHC found themselves marched up the field on a couple of occasions when penalty awards were, rather too vigorously, contested. This put Linlithgow in a good position to score again. And so they did. Another penetrating run from their wing left the full-back with the ball and a fairly uncontested gallop over the line. Again the kick went over and the score was now, a slightly more worrying, 24-19. However, a rather more evenly matched, possession and territory wise, final 15 minutes, saw RHC managing to pull away with a penalty, followed up by a speculative drop goal from in front of the posts to leave the final score at 30-19 to the Cougars. The period was slightly enlivened by a couple of contrastingly received yellow cards. RHC were first up and their ‘victim’ was so certain, that he was halfway to the touchline before the referee had stuck his hand in his pocket. Linlithgow’s yellow-carded player however, another forward, received his with the ‘industry standard’ look of complete amazement and innocence! All in all, a fair result for the Barnton-based team which places them third in the table behind Livingston and Preston Lodge, with 15 points and Linlithgow fifth, just four points behind.